Schach DVD The modern Two Knights | Videolektionen | Eröffnung | Training | ChessBase | Schachversand Huber - Spielen Sie eine Partie Schach ! 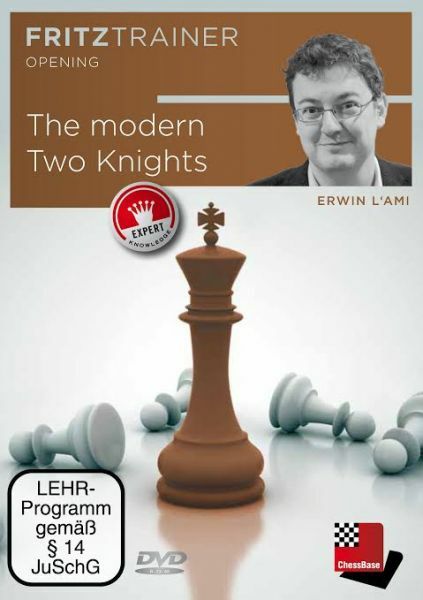 Produktinformationen "Schach DVD The modern Two Knights"
The Two Knights Defence is one of the oldest opening lines in chess history. The sharp positions, arising after the moves 4.Ng5 d5 5.exd5, have intrigued players for many decades! World Champions like Wilhelm Steinitz and Bobby Fischer shaped the opening, and in more recent years, Nigel Short has popularized it. In the main lines, black gambits a pawn – with fascinating consequences. This DVD is aimed at players of both sides, giving an objective overview of all relevant theoretical lines. The DVD also includes a database with model games and an interactive section with memory markers and tactics where the viewer can test his newly acquired knowledge. Grandmaster Erwin l’Ami is a member of the Dutch national team and was the second of former World Champion Veselin Topalov. In this DVD he does not keep any secrets and reveals all he knows about the Two Knights defence, including a lot of brand new ideas and novelties! Kundenbewertungen für "Schach DVD The modern Two Knights"